2 Bedroom, 2 Bath, Annual Floating Use, Special Season (weeks 1-17 and 51-52). 2 bedroom, 2 bath, Annual Floating Use, Special Season (which is weeks 1-17 and 51-52). 2 Annual Special Season Weeks ($1800 each) and 2 Annual Sport Season Weeks ($1000 each), 2 Bedroom. Marriott’s Cypress Harbour timeshares are designed to create dream vacations. Nested in an idyllic setting near Orlando’s most famed attractions, Marriott's Cypress Harbour features picture postcard beauty that charms each and every one of its visitors. Stress quickly melts away as you stroll the beautifully landscaped grounds. Contributing to the dreamlike effect, the weather is perfect year round in the state known for its constant sunshine. Gentle breezes from the nearby beaches create beauty in motion as the palm trees wave and the lapping sounds of the ocean soothe away all cares and worries. 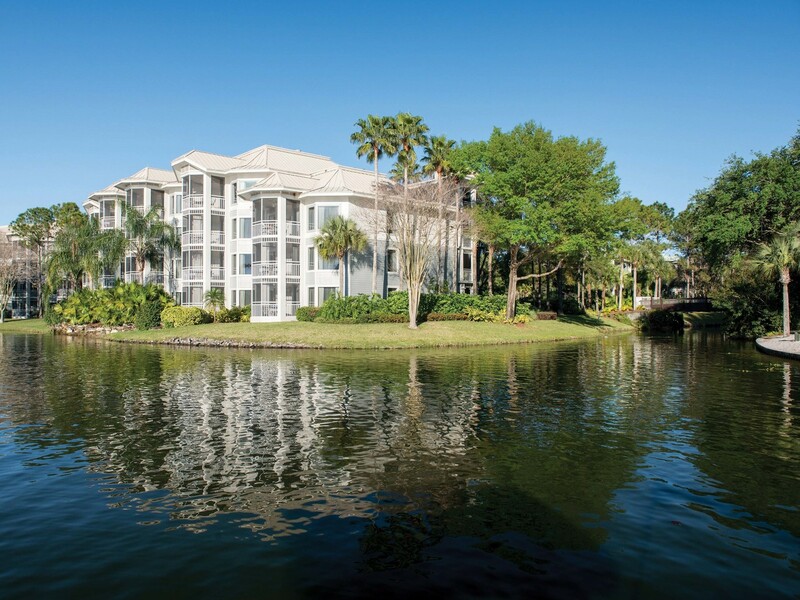 The statuesque mansion of Marriott's Cypress Harbour timeshare resales is a tribute to Old Florida plantation style charm yet features all of the amenities of today. Its private balconies overlook a crystal blue lake edged with beautiful cypress trees and palms. The serenity and beauty of the setting, coupled with exquisite private villas, make it the ideal romantic getaway for couples. The easy proximity of every child’s dream destinations -- Disney World, Universal Studios, Sea World – and many more all within a stone’s throw, make a Marriott's Cypress Harbour timeshare resale a fantastic way for families to take hassel-free vacations. Should guests be able to bring themselves to leave this enchanting resort long enough to explore the area, they’ll find many activities perfectly suited to them no matter what their taste. Marriott's Cypress Harbour timeshares are close to some of the state’s best outlet malls. Golf enthusiasts will head to the other side of the pond on the grounds to challenge their skills at the Faldo Golf Institute. Discovery Cove offers the memorable opportunity to swim with dolphins while Gatorland is a nearby 110 acre theme park where adventure and reptiles await. Also nearby is beautiful Busch Gardens and Universal Islands of Adventure. Space enthusiasts can take a day trip to the Kennedy Space Center to tour NASA’s facilities; kids will enjoy the opportunity to meet a real astronaut. Location alone is a terrific reason to buy one of our Marriott's Cypress Harbour timeshares for sale, as it enjoys some of the most prime real estate in America! The grounds of Marriott’s Cypress Harbour fulfill all guests’ needs and wants so that after an exciting day, they can return to the property to indulge. It features onsite restaurants to suit every food taste. The Florida sun can best be enjoyed at one of the three sparkling heated pools; children even have their own pool (as well as their own activity center). Of course there is a hot tub, sauna, and Jacuzzi to relax muscles that have been overworked from a day of fun or time spent at the well appointed fitness facility. There are arts and crafts to unwind, or boat, bike, or inline skate rentals to release that extra energy. And no high class resort would be complete without tennis courts and beach volleyball. Each villa hosts sufficient space and amenities for eight guests, boasting two bedrooms and two bathrooms. Guest rooms include a television with VCR/DVD combo player and a screened private balcony porch. In addition, they feature a queen bed and a sofa bed, screened balcony porch, and a bar sized refrigerator to keep refreshing beverages close at hand. Master suites include a king-sized bed, a sitting area, and their own oversized tub. The separate living area includes an additional full-sized sofa bed, dining area, and breakfast bar. The spacious villas all include modern kitchens with all the amenities of home, with an oven, microwave, dishwasher, full-size refrigerator, and of course all dinnerware and cookware with which to prepare and enjoy the meals. Guests can attend to their own laundry with their own in suite washer and dryer, keep current with high speed internet access, or simply savor the sunshine from their private patio or balcony with sweeping views of the beautiful landscaped grounds, taking in the fairway or sparkling lake. The property has a total of 510 rooms spanning 4 floors, and a meeting room with 540 square feet of meeting space. Guests can take advantage of concierge services, babysitting, room newspaper delivery, and business services. The grounds feature a barbecue and picnic area and a game room. To ensure a spectacular worry-free vacation experience, the property arranges a variety of guest services such as a grocery shopping service, valet dry cleaning, and dinner delivery from local restaurants. It is a breeze to sell Marriott's Cypress Harbour timeshares because every guest falls immediately in love with the dynamic experience they’ve enjoyed during their visit, and will want to start planning their next visit! Premier Timeshare Resale is the place to find professionals who will get the job done and not charge you anything unless they do. Marriott's Cypress Harbour fractional ownership makes it affordable for investors with any budget. If you’re considering buying a timeshare resale, let Premier Timeshare Resale's agents help you decide if timesharing is right for you and find you the best priced resale deals on the market. Find the perfect Marriott's Cypress Harbour Timeshare Resale for you today!